In case anyone is not paying attention, there is a new oppressive entity to humanity outside of government and transnational corporations. Outside of even police, the court system, banks and similar authorities. It's the entity of “crisis actors”. The modern day crisis actor, a concept which most people globally have not yet wrapped their heads around, is a synthetic entity born of the new world order. Most people don't truly understand this phenomenon yet because it still hasn't picked up 9/11 sized attention across the globe. Nevertheless it is a real entity and you may not have noticed yet but they are the new anti-truth bullies. Call them out on their inconsistencies, ask for genuine proof, or ask questions and that constitutes “harassment” which could cost you your job, your reputation, your freedom or worse. As we speak, the controllers (likely with the help of AI software) are calculating how to criminalize the search for truth. This entire fight for freedom and truth involves putting things on the line on both sides. And this is something we are seeing with the latest Sandy Hook law suit where several Sandy Hook “families” are suing Bushmaster Firearms International and Remington Arms for manufacturing the AR-15 rifle which they claim a super lightweight unconfirmed character named Adam Lanza used to professionally execute 28 people in a matter of minutes leaving no video, physical or even medical evidence while in the process. Welcome to the Sandy Hook story, an event many of us recognize as an artificial, 2-dimensional reality based staged and carefully scripted, made for TV event. The Sandy Hook show of December 14, 2012 is unique in many ways as it's one of the first staged events to pull in actual professional Hollywood actors to pull off the role of crisis actor parents who lost family in the shooting. Sandy Hook is also unique in that some of the crisis actors have turned aggressively against truth seekers who threaten their fund raising money-making scheme whose count has surpassed 30 to 40 million dollars, and that doesn't include major Sandy Hook charities who admit they “cannot account for money raised”. These chilling words Lenny hopes will serve as the voices of the crisis actor family members who are now caught in a winner-take-all and do or die scenario where they need to defend their lies or else. He also hopes this acts as a deterrent to anyone asking questions by intimidating them into being silent. They need to maintain the 2-dimensional artificial narrative based on the original script which states that 28 people were massacred at Sandy Hook Elementary. And they realize that the only way to stay out of jail and to prevent facing the penalty of their crimes is to accuse your accusers first and then see who wins. This latest lawsuit against the manufacturers of the AR-15 seeks to not only reinforce the Sandy Hook scripted lie but to stage a legal case for blaming the makers which would give them victory on multiple levels. On the one hand there is the money to be gained by winning a lawsuit. That would add to the tens of millions of dollars the Sandy Hook families have already stolen from the general public. On the other hand an unprecedented victory against the gun makers would send a strong message that the gun control agenda now has a new life and that gun makers should beware as they are now the new financial targets of all future “shootings”. There are several things to note in this recent kangaroo court hearing attempting to pin the blame of the Sandy Hook story on the gun makers. 1- The hearing is taking place in Connecticut, the very state whose authorities have been tightly involved and cooperated with the Sandy Hook event from beginning to end. 2- The judge Barbara Bellis needs two full months to rule whether this case should move forward. Is this issue that unclear and that compelling that she needs two full months to think about it? What will happen during that two month period? The answer lies in realizing that they are looking to reverse the 'Protection of Lawful Commerce in Arm Act' (PLCAA) of 2005 which shields gun manufacturers from lawsuits involving the use of their manufactured guns. This is another major purpose of this court hearing. If they could knock off the PLCAA, that is equivalent to passing SOPA or CISPA for the internet. From a new world order functional perspective it's equivalent to the TPP agreement, the NDAA or Military Commissions Act. 3- This story is taking place as somewhat of a side show in case things don't work out for the conspirators. If the case turns in the wrong direction they will then pretend it never happened and the story will be buried. If they win however, suddenly this will be headline news. One can see this as a trial run as well, to see how far they get and what obstacles were met. This is a very important point I hope people see. The thing to take away from all of this is that the new world order is one big construction site right now and all the major stories we are seeing today put out by mainstream media are designed to add functionality to the rising new global order. We need to all realize this. As you can see, in this government created gun control logic, which is no different than blaming a car maker for someone driving recklessly and killing another person, the gun makers themselves are somehow to blame for the murder which of course in this case lacks evidence ever happened. Keep in mind that in this gun control logic, peace love and a crime-free world will only happen when the entire country and the world is somehow a gun-free zone, and when ONLY government and the police state has ALL the weapons. Then life will be free of mass shootings because the bad people simply won't be able to obtain the guns. Gun control logic states that a piece of legislation will magically shut down the entire global gun black market! It suggests that only after the masses and the good and responsible individuals are completely stripped of all rights to own firearms and stripped of all ability to defend themselves from mass shooters and intruders, then the goals will be reached according to this logic. That an unarmed general public historically goes directly hand in hand with government tyranny, oppression (like we're all seeing for years) and mass executions and mass genocide is just silly talk to be ignored according to gun control logic. You are all being put on notice. 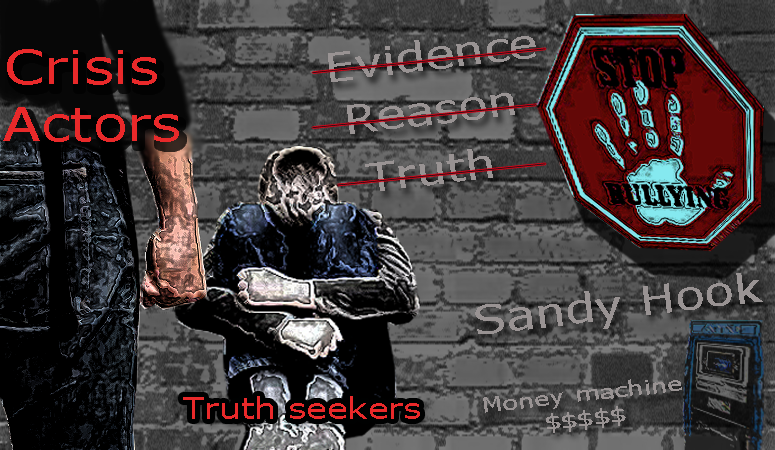 We the truth seekers who work every day and go about our business, those of us who just want to know the truth so that we can live in a peaceful, honest world- we eagerly desire that all suspected crisis actors involved in the Sandy Hook event answer to the rest of the people who are aware of the gross errors and inconsistencies surrounding the event. Inconsistencies that you cannot account for no matter how hard you try. We want to hold YOU accountable for your stories and your attack on humanity with lies and deceit. All we ask is for you to prove your case in a properly functioning courtroom of law with no hiding of evidence. Even if all the allegations were wrong about the Sandy Hook hoax event, you still have an obligation to respect free speech and you have an obligation to provide evidence and explain yourself to the world. Hiding behind mainstream media propaganda and attacking truth seekers has only dug all of you into a deeper hole. I have a feeling that a Sandy Hook trial is coming and it is up to us to make sure it doesn't turn into another Boston bombing, WTC bombing or Oklahoma City bombing kangaroo controlled evidence trial. I believe Sandy Hook is going to court and hopefully we will hold ALL crisis actors to the fire with the easily available evidence that will show that they are lying and they will have a chance to prove their case to humanity before they are sentenced. Until this day comes we need to all stay vigilant and beware of this new crisis actor phenomenon and the players involved which are now the new bullies in town here to take your money, your reputation, and your liberty away while laughing their way to the bank. If you understand the seriousness of this story and what is at stake please help share this information.